* Quick charge with automatic constant current control prevents battery from over charging, short circuit, and electronic shock. * Charge your cell phone battery without the phone. * Also work with OEM (original) battery. * LED charging light indicator. Turn red in charging, turn blue when done. * Input: AC 100-240V 50/60Hz 150mAh. * Output: DC 4.2V 350mAh ± 50mA. * USB Port Output: 5.2V 800mAh. * Use this charger to charge the stock battery as well, swap one out when the other dies. * Battery Capacity: 2950mAh . * This Battery could also be charged in the phone directly thru the cell phone charger. * Color: as shown in picture. * Material: durable& lightweight plastic. * Size: 5.2cm x 3.5cm. * Sits your Android Smart phones in a stylish way. * Suitable for your smartphone or tablet upto 8". 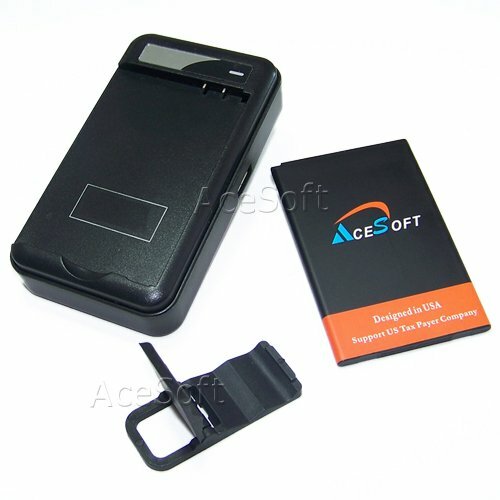 If you have any questions about this product by AceSoft, contact us by completing and submitting the form below. If you are looking for a specif part number, please include it with your message.